When highly accurate temperature control under extreme conditions is required, the testo 176 Series are the right choice. In the interior, a precise Pt100 sensor measures the temperature. 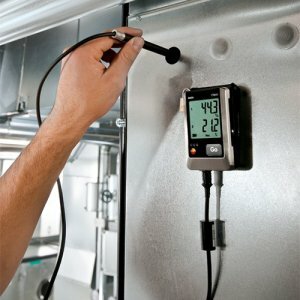 The testo 176 series are excellently suited to the recording of temperatures over long periods. The models 176-H2, 176-T1, and 176-T3 have a metal housing that is resistant to extreme mechanical influences and hard impacts, making the data logger suitable for use in industrial surroundings. The free ComSoft Basic software allows fast programming of the data logger and easy data analysis. The testo 176 series are a reference class data logger which can also be used to calibrate other data loggers. Like all Testo data loggers for use in the food sector, the testo 176 series are tested by the ATP testing section of the TÜV Süd according to DIN EN 12830.